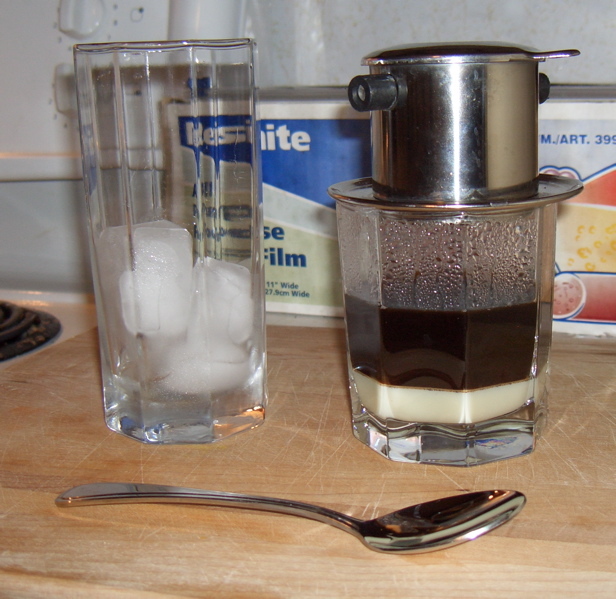 Ca phe sua da or cafe sua da is a unique Vietnamese coffee recipe. Literally, the name means "iced coffee with milk". In northern Vietnam, it is also called ca phe nau da, meaning "iced brown coffee". Left: Ca phe sua da ready to be stirred, poured over ice, and enjoyed. Ca phe sua da can be made simply by mixing brewed black coffee with about a quarter to a half as much sweetened condensed milk and then pouring it over ice. Many Vietnamese immigrants in the Southern United States, particularly in Louisiana, use the regional dark French roast coffee, often with chicory. Otherwise they use an imported Vietnamese-grown and medium-roasted coffee without chicory. The coffee is traditionally coarsely ground, then individually brewed with a small metal Vietnamese drip filter, into a cup containing the condensed milk. The condensed milk and coffee are stirred together and poured over ice. In modern times some people add whipped cream on top. Place ground coffee in Vietnamese drip filter (see the photo above) and screw lid down on the grounds. Put the sweetened condensed milk in the bottom of a coffee cup and set the coffee maker on the rim. Pour near boiling water over the screw lid of the drip filter; adjust the tension on the screw lid just till bubbles appear through the water, and the coffee drips slowly out the bottom of the press. When all water has dripped through, stir the milk and coffee together. You can drink it like this, just warm, as ca phe sua nong (literally, "hot coffee with milk"), or over ice, as ca phe sua da. To serve it that way, pour the milk-coffee mixture over ice, stir, and drink as slowly as you can manage. If you can't find a Vietnamese drip filter, regular-strength espresso is an adequate substitute, particularly if made with French-roast beans or with a dark coffee with chicory. Vietnamese coffee should taste more or less like melted Haagen-Dazs coffee ice cream.